For curious people: Get to know and love - Bathe them, Feed them, Walk with them. Experience elephants, where they live. We slowly introduce to these magnificent pachyderms. Learn to ride elephants where they live - individual, with a good conscience in the woods of Thailand. Worldwide unique - handling elephants. Lead the grey giants & get to know Thai culture off the normal tracks. On tour through the woods, sleeping next to elephants near small rivers and not missing good standard - exclusive & luxury. In Hannibals foot steps: On tour through the mountains with elephants - sleeping in tents. Click here for more articles and press releases. Sustainability: Ensuring a furture for elephants. For questions regarding our tours please send a message. 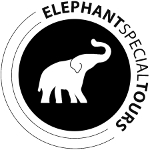 My 3 day elephant education trip with the “Elephant Special Tours” was without question the best unforgivable experience of my life. When I look back to these three days … it gives me creeps and a big bright smile in my face. I don´t like to tell you what I’ve done in this three days … but all in one … it was a great experience, fun and just amazing. Oh yes, I was searching a long time at the internet to find an elephant center what I was looking for. For me it was very important that they treat the elephant very well and keep their animals under species-appropriate living conditions according to the current state of knowledge in order to foster animal welfare. There are quite a lot companies around who offer this cheap one hour elephant riding or washing trips. Of course you can earn with these “shows” much money … but do they invest this in the elephants and take really care about them?!! Anyway, the elephant special tours were the right choice. From the first contact for booking, the pick up from the hotel, the fantastic accommodation (MaeWang Guesthouse), the loving care and drop of in your hotel …. all in one perfect and well organized. I got in this education trip so much more than I expected. I have not only learned a lot about the elephants, I got also some useful information’s about their wonderful concept and an introduction in the culture/local life around. And while I´m writing about this … my emotions running high from the time with these gentle giants. Never will I forget the first contact with my elephant “Chum Chang” when he was laying his trunk around me. If you are looking for a company who do protect the last elephants und spend nearly every cent in these … do not look further. Of course … they seem not the cheapest on the market … but you will quickly understand why and learn about this big challenge to safe our last giants. Be a part of their great concept and do a tour with them. Thank you so much Roger & the rest of the team which offered me these incredible experiences. It will forever touch my heart. The camp and the people are just great. The accommodation is perfect, food and service too. They way the elephants get treated with great respect is wonderful. I learned so much about elephants and riding and swimming with them was an experience I will never forget. I had a outstanding time and would really like to go back. I am guessing the longer you stay, the better it gets. These animals are simply very special! The camp is great, the groups are small and we got to have a long chat with Bodo in which he explained his camp’s approach in how to sustainably help the elephants. We wish him the best of luck!